Like hotels, my priority in resorts still lie in the bathrooms, but pools also are a huge factor for me. 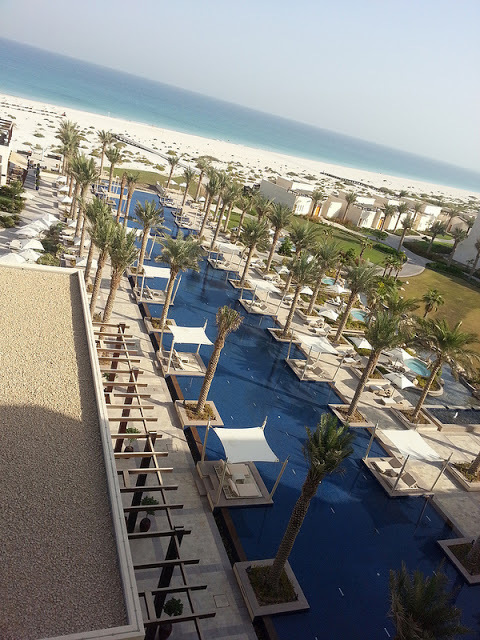 In fact, I know some people who gauge if they want to stay in a resort just by looking at its pool. So today, I’m listing 8 Resorts that I’ve been to with the most amazing pools. I prefer private pools but in this list, we’re talking about common-use pools that are so stunning, you wouldn’t be able to resist a dip. 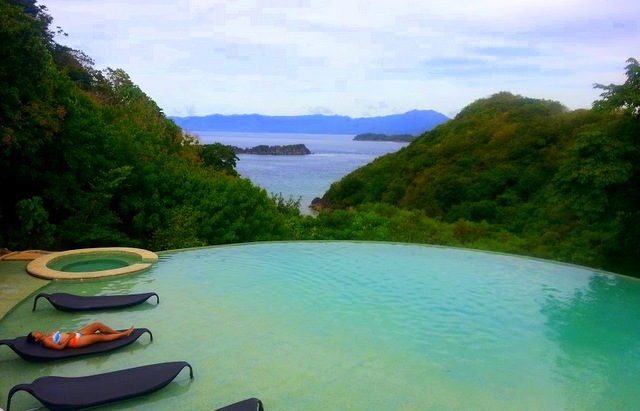 As far as pool views go, this still has got to be one of the best as it has both mountains and the sea. It was really comforting to spend hours in this pool because the water temperature was warm. Now one thing that sometimes deters me from swimming in a common-use pool are fellow guests. But you won’t have any issues with that in this resort. It can be both good and bad, but transportation to Tugawe Cove is really a pain in the neck. Not to mention quite treacherous too (Read my full review here), so as a result there are hardly any crowds in this resort. But that’s the main reason why I loved my time there – the privacy. 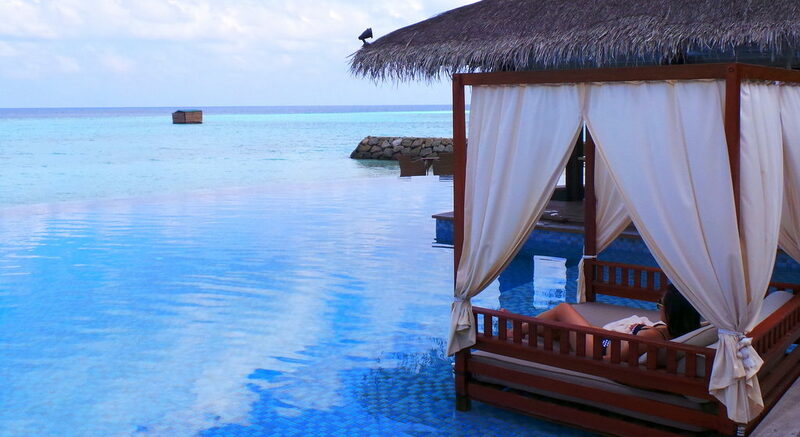 There are two pools in Huvafen Fushi, and both are equally stunning. I love the mosaic tile pattern in the second pool (bottom) as it somehow resembles the seashore. 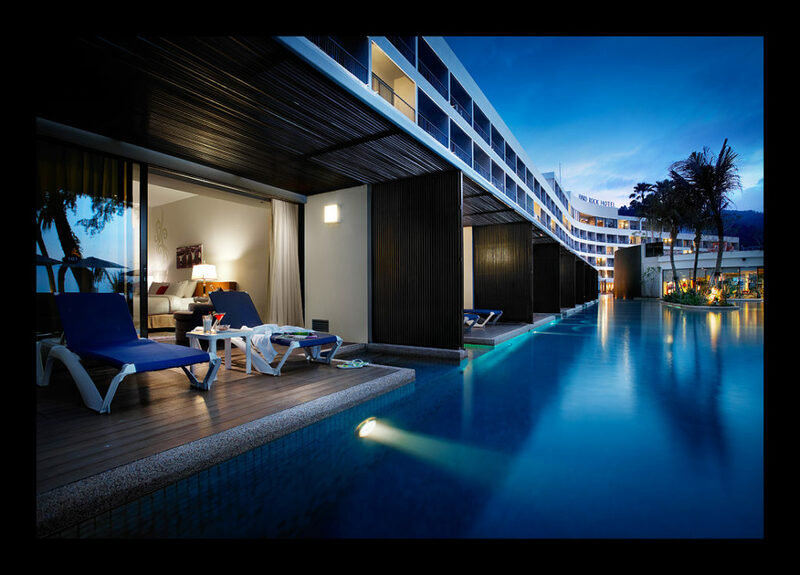 The different shades of blue make it really relaxing and creates a seamless vision of the pool merging into the sea. Huvafen Fushi is also a resort that is quite private and exclusive so you won’t have any issues with the pool being crowded. I love how the pool at the Residence Maldives is lined with cabanas/ lounge that are in itself submerged into the shallow part of the pool. The couch easily fits 2 people and you can spend a lazy afternoon alternating between reading and sun bathing in the lounge, then quickly dipping into the pool, and repeating the process until sunset. These cabanas extend well into the beach and at night, The Residence Maldives plays a movie ala outdoor cinema so guests can lazily lounge and watch under the moonlit sky. These spots can be popular with guests so coming early or at the right time is necessary if you want to save a spot. Viceroy Bali (located in Ubud) only has a total of 25 villas, so even on full capacity, this pool always looks serene and quiet. But there really is something about a pool that overlooks a jungle that was once known as “The Valley of the Kings” as this area once were occupied by Balinese royalty. Very refreshing from the usual resort pools that overlook or have a view of the ocean. If resort pools were actors, Alila Ubud’s pool is certainly Katherine Hepburn, (or Meryl Streep) as this pool’s won numerous awards and made it to many travel lists of best resort pools in the world. It’s not hard to see why. 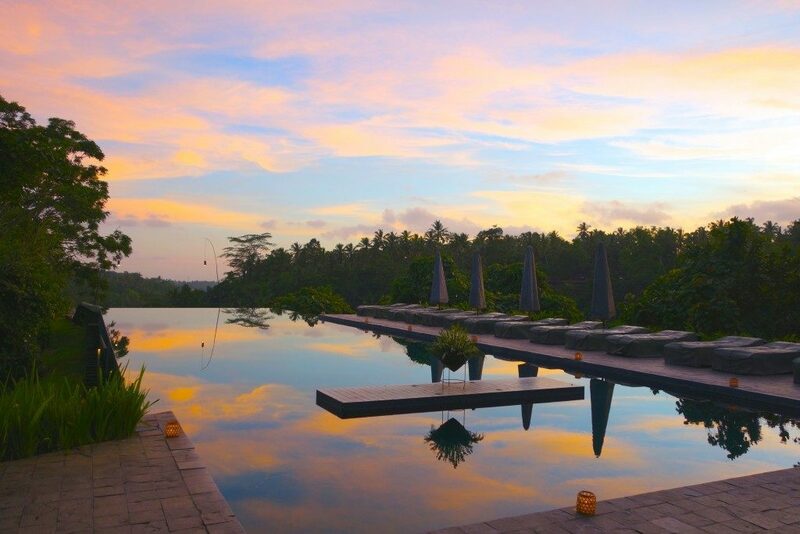 Alila Ubud’s pool is so beautifully situated that it reflects the skies and even sunrise and sunsets. 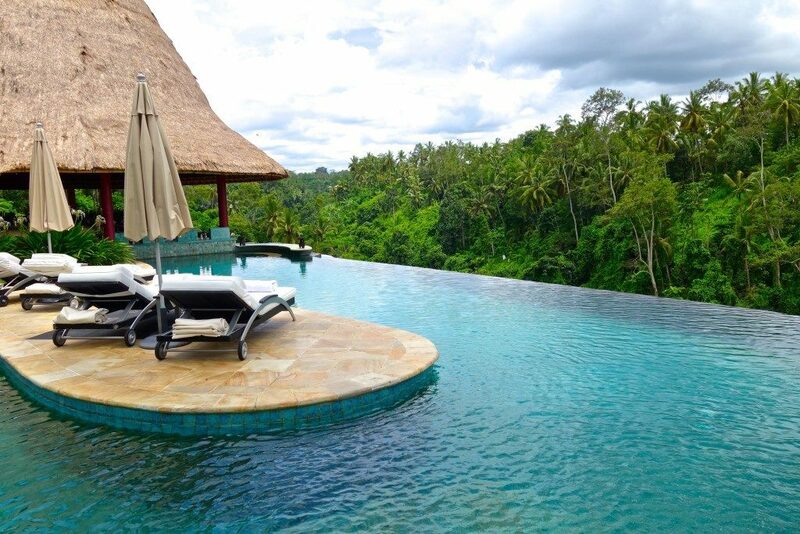 The resort itself is in a hill and the pool’s edge overlooks a nice view of the Ubud jungle. Apart from this pool being both a ‘private’ (aka easy access) pool for certain rooms, it also doubles as a common-use pool. What strikes me most about this pool is the strong 70’s ala Palm Spring hotels vibe that it gives. 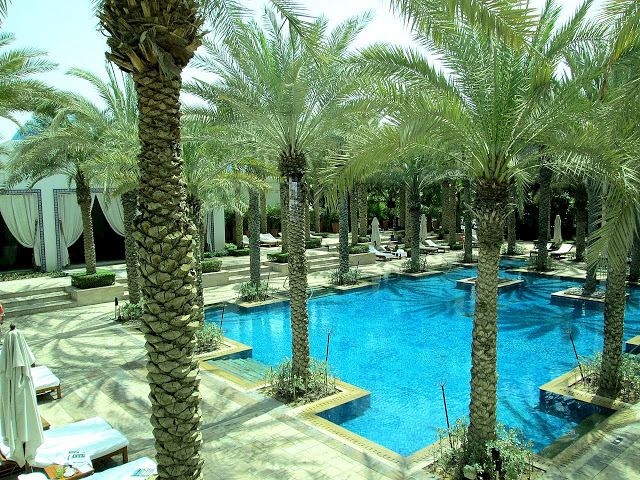 For most hotels in the middle east, privacy is a huge priority and I like how the pool at the Park Hyatt Dubai is slightly hidden and secluded, while still being at the centre of the hotel. The palm trees surrounding the pool are also very well placed , adding to the privacy but at the same time enhancing the overall design and feel of the pool. It’s the WOW factor of when I first saw this view that did it for me to include this in the list. I arrived in Abu Dhabi really late at night (or even early morning) as most flights from Europe (I flew from London at that time) arrive in the Middle East around 12 midnight. When I checked in the hotel, yes I was impressed with the room but it was really dark and late at night that I went to bed immediately. Nothing prepared me for this sight when I drew the curtains open. I love how the pool cabanas have such wide spaces in between, which gives guests ample privacy. This is just my personal list of resort pools that have so far amazed me. Expect this list to have more additions the more I explore! Are you also into resort pools? Which resort pool do you think should be added on the list? 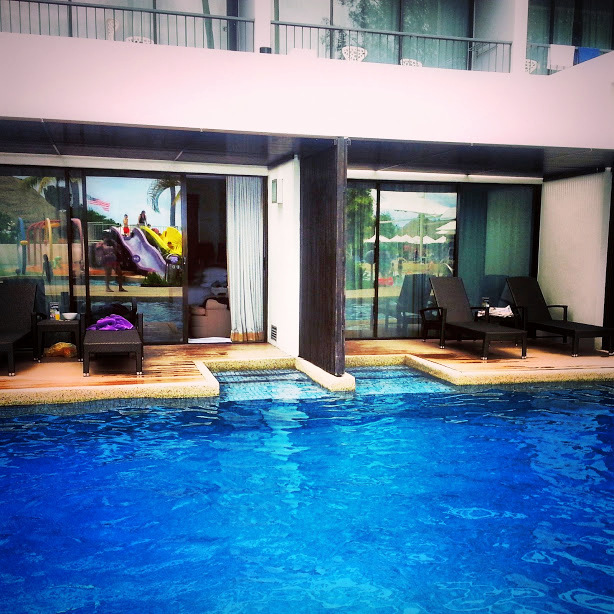 Hello Jean for me travelling with kids the pools have been at the Outrigger Fiji and the Padma in Bali. Both superb!! Not to be sneezed at is the pool at the Crowne Plaza Hunter Valley too. For me the Kempinski Resort at the Dead Sea is a stand out. And don’t leave out (Rick Stein’s) Bannisters in Mollymook here in Oz. The Residence Maldives looks stunning, and I can’t wait to visit Bali and enjoy the pools there. I’d add the pool at the Biltmore, Florida to your list, it’s the largest in the States and Johnny Weissmuller (aka Tarzan) used to swim there!